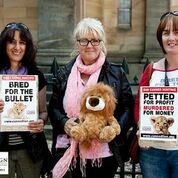 Last night was our Blood Lions screening in Edinburgh and all went very well! Had an ok turn out for wee Edinburgh and it was a delight to meet Pippa in person. I'm so happy we have been a part of spreading their message and this film! On the first Global March For Lions there was one city in particular that put on a show that I found unforgettable. Caged lions and hunters played a central theatrical part in their protest. And it’s been on my mind since. In August every year Edinburgh turns into a metropolis for comedy, theatre, music and art. During a whole month the city flares up and every space available turns into a venue for performance. 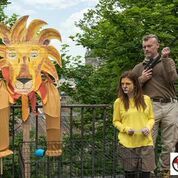 Inspired by this upcoming Fringe Festival, as well as the GMFL protest, the Scottish lion campaign went out onto the streets of Edinburgh to put on a roaring show. There’s a big square like space in the heart of Edinburgh that is quite often used for demonstrations as it has a lot of foot traffic. This is where we met on July 18. And this is where my heart sunk. We had made so many preparations to use theatre and music a part of the demo but on this day not only was it blowing strong winds that already swallowed sounds, there was also a pipers marathon happening on the square – 6 hours of bagpipes and drumming! The loud blare from the bands would completely drown the lions roar. We had to find an alternative location quick! And actually the assembly of musicians turned out to be quite a blessing in disguise. Leading down to the square is a long set of stairs and a narrow walkway that ties old town to new town. This walkway is normally lined with craft stalls but on this day there was only two. We made camp behind the little jewelry tent and got our gear out. The wind blew the sound of the bagpipes in the opposite direction so we did not hear a thing. Also the walkway was bathing in sunshine and we were sheltered from the wind, there was not even a breeze present. Soon all 24 lionhearts had taken their positions and I think we made quite an imapct. We had a fallen male lion with a hunter proudly posing over his kill. We had a caged little lioness and a banner stating #BredForTheBullet next to the cage. Beside the cage sat two volunteers, one happily stroking the cub she is raising, and the other was holding a placard saying “I’m the Con in conservation, I raise lions for the bullet”. In less than two hours this amazing lion team had handed out over 350 flyers and got almost 200 signatures on our petition. And there was no escaping the 3-meter long banner shouting ‘Save Our Lions – Ban Canned Hunting’. We finished the demo with a theatre piece specially written for the occasion by Edie Goodwin – a theatre student and member of the Edinburgh actions group Activists Assemble. In a beautiful juxtaposition 2 monologues told the views of firstly a naïve volunteer full of love for the cubs he had raised at a lion farm. Followed by the monologue of a hunter who had shot one of those lions a few years later and who spoke about the thrill of shooting this feeble animal. It was a powerful contrast – and the very sad truth for many lions in South Africa. On a more positive note a local Edinburgh talent provided us with music, and to the tones of ‘Lions sleeps tonight’ we all found the upbeat sprit again. After two hours of protesting we headed to a function room that was booked for us in a bar up the road and we had a quick debrief before spending a couple of hours just lioning around. I want to sincerely thank everyone who came out on the day. I also want to thank everyone who couldn’t make it but who roared with us in spirit. And a special thanks to Edie, Adrian, Jenny and Michael for making my wish of music and theatre come alive! Scotland roars in London for Africa's lions. 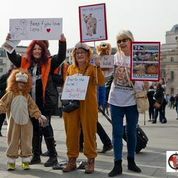 On March 13th CACH Scotland headed down south and joined the Global March for Lions held on Trafalgar Square in London. It was a fantastic day with a wonderful atmosphere and we enjoyed meeting so many like minded who came out to roar for lions. 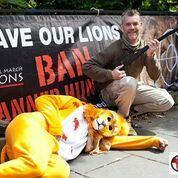 Since last year CACH Scotland has been collecting signatures against canned hunting which had nearly 300 signatures on it. We handed over that petition to an embassy official on the day. 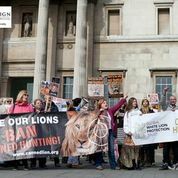 It was an amazing feeling to be inside the embassy building while listening to a very vocal group of lionhearts standing by the entrance chanting 'Save Our Lions, Ban Canned Hunting'! Later on we went to Oxford House in Bethnal Green, where the Death For a Trophy exhibition opening took place. It is an exhibition to promote a documentary by Marta Ariza about canned hunting in South Africa - and the opening event that was held in conjunction with CACH, Born Free and Global White Lion Protection Trust. This was certainly a day to remember. Our strength is in our growing numbers. Every day people start speaking out against the monstrosities of the canned hunting industry. 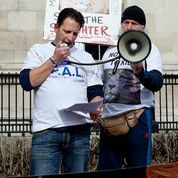 And spending the day together with those who lend their voice to the voiceless was encouraging - we give each other the strength to keep roaring for lions! Please do take a look and the video of London's event. He found us because of the Global march and contacted me and wanted to get more involved with our campaign. He's from up north in Scotland and he's passionate about lions and conservation. And he has done photography work for Kevin Richardson and will return to South Africa in May 2015. "I'm Jamie, or James - either or! I'm 19 and live in the Highlands of Scotland, natures playground... Gods country. I work in the mountains, live in the mountains and play in the mountains. I love nature, wildlife and everything outdoors. I first met Kevin in May of this year, on the invitation to do some work with him, I then, following that joined the volunteer project at Welgedacht after seeing the amazing work they do. I spent a month looking after and caring for Kevin's Lions, Hyenas, and Black Leopards. I also assisted with filming for a documentary being filmed. Chatting to Kevin, and being told the truth behind the plight of lions, really triggered something in me, and made me realize WE NEED to get together and do something about this! I'm a keen, semi-pro photographer, with this taking up nearly 75% of my spare time, in the other 25% I'm set on helping save these majestic creatures. The big game of Africa needs saved, so our children, our grandchildren, great grandchildren can all see the beauty that lives on a truly amazing continent. I'm really pleased, and super proud to now be part of CACH Scotland, where we can bring everybody together and raise awareness about cub petting, canned hunting, and the other atrocities going on, on the African continent! 'll leave you with a photo of myself, so you can recognize me at marches and events... And one of my photos from Welgedacht - Souja the lion!" 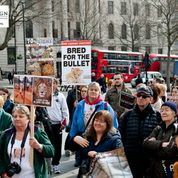 "After seeing our people in action at the Global March for Lions, David Nash was inspired to donate his work for our cause". I got approached by a young lady and received an invitation to go to the University of St Andrews to have another talk. We are currently trying to find venue and set at date. "I think canned hunting is particularly disgusting and simply don’t understand the mentality of killing animals for “sport". Stalking cheetah on foot and shooting with a long lens is more than good enough! So I am delighted to support this." Prints will be available in A3 size at our Xmas stall at the Priory Church in November. On the Tuesday evening me and Julia from 'Scotland for Elephants' went to Edinburgh University to have a talk for the Animals Rights Society. About 25 people turned up - not only students as these meetings are open to the public. I had prepared a slide show with bullet points and quite a few images. I started off by showing the 'This is Leo' video (which everyone loved) to sort of ease everyone into the subject. My talk lasted for about 20minutes and was followed by a Q&A. The response was great. As usual people were left stunned by the fact that cuddle farms are a part of the canned hunting chain. Everyone seems to know someone that has petted a cub in SA. After the meeting I talked to one of the members of the group and she offered that whenever I'd like a venue for an event they could book us in at the University for free. Another exciting outcome of the talk is that the Uni students are putting together a comic book type Animal Rights Manifesto and they are designing each page to explain each of the many different issues relating to animal rights. This manifesto will be distributed around Edinburgh. Campaign Against Canned Hunting was invited to have some of these pages on the canned hunting industry as the group felt so strongly about the issue. We have already emailed and decided to meet up soon again to discuss this collaboration further. Falkirk Charities Day is an annual event when Scottish charity organisations get a great opportunity to raise awareness and funds for their campaigns. Rows of stalls stand along High street and this year CACH Scotland had a spot there. We got the tip via our friends at Animals Asia, who also were our neighboring stall. 'Team Roar' arrived at 9.30 am and we quickly set up the stall with our huge banner, flyers, the petition to ban canned hunting, some goods to sell and tombola for the children. After a few days of rain we were lucky enough to get a bit of sunshine, which brought the local shoppers out on the streets. Being only our second event this summer we didn’t quite know what to expect regarding peoples response to our organization and cause. When we had a stall at Hopetoun House not a single person had ever heard of canned hunting and was shocked over this vile practice. However on this day in Falkirk, to my surprise and joy, there was quite a few who said they had read about it on Facebook. With only weeks between the two events I was extremely pleased to hear this as it means that we are managing to get the word out there. Slowly the truth about canned hunting is being brought out into the open. And with help from the public we can step up the fight against it. Everyone we spoke to was happy to sign our petition. We also gave them information about the global march coming up on October 4. We could have wished for slightly more people being out and about – but we still managed to reach a fair number of passer-byers. 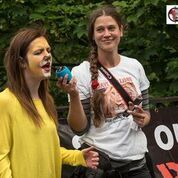 People that yesterday never heard of CACH, but today know that we are out there roaring for lions. As the marching band of Scottish pipers passed by our stall I felt in my heart that the bagpipes and the drums played for our lions. Scotland is on our side. And when someone grabs a flyer, look you in the eyes and tells you to ‘keep up the great work’ – then you know that you’re gaining strength in numbers. Every day there is a few more people in the world who wants to see the end of canned hunting! On the 28th and 29th June we had a stall at the Hopetoun Horse Trials together with several other animal charities such as Animals Asia, Shark Trust and Scotland For Elephants. The Horse Trials is a popular horse jumping event that attracts thousands of visitors every year, one of the visitors this year being British royalty Zara Phillips. It was a great opportunity to reach out and spread awareness about canned hunting. Over the two days we spoke with a great amount of people and the initial reaction seemed to always be the same. A lot of people from the UK just can’t believe that breeding of lions is taking place in our time. To them it sounded like an outdated crime against nature that surely had been banned a century ago! When they realized that this is actually happening right now they all gave their full support to our cause. On several occasions they asked for a petition to sign before I even brought it up. The response we got over our cause during the two days was nothing but positive. We introduced ourselves as a member of CACH and that we just had started up in Scotland as the organization had started to branch out internationally. Being the first event in Scotland it was great to have people ask questions about what we’re doing, about the industry and then to appreciate our work. We even had Lions Club International suggesting that we should do collaboration for lions in the near future. This campaign is to raise awareness about cub pimping and that it is the first step in the vile canned hunting chain. Using the plush toy we easily got children interested and reached a younger crowd as well as adults. Many had heard of, or seen images, of cub petting but nobody would ever link it to canned hunts. We have put the campaign on social media such as Facebook and Twitter and will use it on flyers in the near future as we have more events coming up in the course of the summer.